Hi everybody my name is Tyler and I am 8 years old. I was sadly abandoned and ended up in the pound but I am now here, safe and well in the care of Senior Staffy Club. I am a very cheeky chappy, who is always happy and up for an adventure. I love people and enjoy my walks. I am good fun and love to play with my toys and I do like to carry a toy in my mouth whilst we are out walking otherwise I do tend to munch on the lead a little. I only do it because I like to carry something whilst on our travels, I think I am being helpful you see so if you give me a toy instead I am quite happy to carry that. I love people and enjoy lots of fuss too and I know some basic commands and will sit nicely for a treat. My friends at the kennels where I stay have introduced me to some nice doggy friends and I dont mind walking with them, but I think I would like a home all to myself, as my personality is big enough to fill a house on its own...lol! I am waiting to have my cat test so will let you know how I get on soon. I am quite cheeky and will always make you smile. I don’t mean to get into mischief I just have lots of energy and enjoy looking for fun things to do. Senior Staffy Club - it tells you how to below. Tyler is vaccinated, neutered and microchipped. He is currently in kennels in the Worcester area but can be rehomed anywhere, pending a home visit, however you should be prepared to visit him where he is. 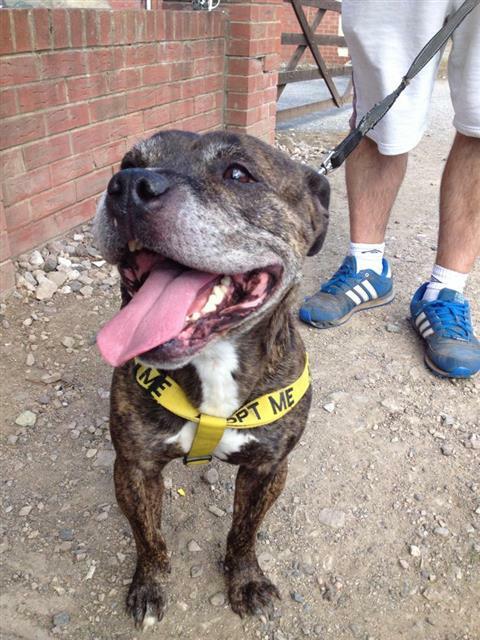 Have you got the time, the sofa, and the love to give Tyler a forever home to see out the rest of his days? » What to do if you plan to move in the near future?